Dory the friendly-but-forgetful blue tang fish searches for her parents. 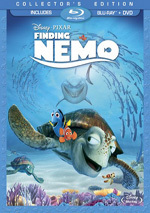 After 13 years, fans finally got a sequel to 2003’s smash hit Finding Nemo. 2016’s Finding Dory revisits the first film’s aquatic universe and expands on its characters’ lives. A prologue reveals how Dory (voiced by Ellen DeGeneres) – a Pacific regal blue tang with memory issues – became separated from her parents Charlie (Eugene Levy) and Jenny (Diane Keaton). After that bit of backstory, we meet up with Dory a year after the first film’s events. Dory remains close friends with clownfish Marlin (Albert Brooks) and his son Nemo (Hayden Rolence). Out of the blue, Dory remembers aspects of her family and where they lived. This prompts her to go in pursuit of them, an adventure that leads her to the Marine Life Institute near San Diego. Dory meets friends new and old as she tries to locate her parents. Does Dory change that attitude? Nope – while the sequel does its best not to remake its predecessor, it seems very similar in terms of strengths and weaknesses. 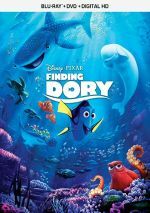 Like Nemo, Dory boasts excellent production values and brings its watery realms to life in a high-quality manner. With 13 years of technological development behind it, Dory comes across even better in that regard. It allows its characters to retain their original design, of course, but it forms a more vivid and real world around them. Pixar films always offer top-notch animation, and that stays the case here. Dory also delivers a terrific cast. In addition to the actors listed above, we find talents such as Ed O’Neill, Bill Hader, Idris Elba, Dominic West, Ty Burrell and others. All of them do well in their parts – especially O’Neill, who adds spark as a grumpy octopus. As I mentioned, the plot of Dory certainly echoes aspects of Nemo, but I think it avoids simple remake-style repetition. Sure, both movies feature journeys to locate loved ones, and it’d be easy to see Dory as a basic role reversal: Nemo featured a parent who seeks a lost child, while Dory focuses on a child who looks for missing parents. That sells the story and character elements short, though. The focus on Dory’s point of view allows for the narrative to venture off in different directions. Despite their basic similarities, enough variation occurs to allow Dory to seem like its own film. With all those positives connected to Dory, why can’t I endorse it as better than just “pretty good”? I don’t know, but as was the case with Nemo, something about the movie simply leaves me a little disconnected. The best Pixar films dig into adult themes and become emotional experiences. Although the studio has faltered some in recent years, outstanding efforts like Toy Story 3 and Inside Out show that they can still bring their “A”-game. Those movies offer rich experiences with real heft behind them. Dory allows us to like and invest in its characters, but it can’t get to the level of the better Pixar flicks. We like those involved and enjoy their journey, but there’s no real emotional development or release – we kinda sorta care if Dory finds her parents, but not in a substantial manner. Dory offers a fun ride and that’s about it. Not that I regard that as a bad thing, of course – Dory presents 97 minutes of consistently solid entertainment. Like the first movie, though, I can’t view at as better than a “B+” adventure. Perhaps we’ll get Finding Marlin in 2029 and that one will astonish me, but for now, I view this series as enjoyable but short of greatness. Footnote: stick around through the entire span of the end credits for some fun tidbits and a great capper. Finding Dory appears in an aspect ratio of approximately 1.78:1 on this Blu-Ray Disc. As expected, the image looked terrific. At all times, sharpness seemed strong. Virtually no softness marred the presentation, so it gave us tight, well-defined visuals. The movie lacked jaggies or shimmering, and it also failed to suffer from any edge haloes or print flaws. In terms of palette, Dory tended to favor a blue feel – and that made sense given the lead character’s coloring and the watery settings. The hues came across as lively and dynamic. Blacks appeared deep and full, while low-light shots offered nice clarity – important in all the potentially-murky underwater scenes. I felt highly satisfied with this great image. Though not as memorable, the movie’s DTS-HD MA 7.1 soundtrack added some kick to the proceedings. Much of the movie emphasized general atmosphere, with the aquatic locations at the fore. These offered a nice sense of place, and some well-located directional dialogue contributed breadth as well. Dory never became an action spectacular, but it gave us a few impactful scenes. In particular, the climactic road chase offered a lot of fun material and opened up the spectrum in a pleasing manner. Music also filled the front and rear channels nicely. Audio quality seemed strong. Effects were accurate and bold, with good accuracy and range, while music appeared full and rich. Speech always came across as natural and concise. The soundtrack worked well for the film. Most of the package’s extras reside on Disc Two, but we get a few components on Disc One. These begin with an audio commentary from director Andrew Stanton, co-director Angus MacLane, and producer Lindsey Collins. All three sit together for a running, screen-specific look at the long gap between Nemo and Dory and why Pixar pursued a sequel now, story and character areas, deleted scenes, visual design, cast and performances, research, music, and related tidbits. The folks at Pixar consistently produce the best commentaries for animated movies because their chats usually focus on all the ways story and characters evolved. We get a great view of how these elements came to be, and I love that stuff. This becomes another terrific chat that remains fascinating from start to finish. We also find an animated short called Piper. This six minute, five-second cartoon shows us a baby bird who struggles with a need to develop independence. Piper probably should be cloying and terrible, but instead, it offers an adorable treat. It’s one of the better Pixar shorts. Though it sounds scholarly, Marine Life Interviews instead goes for comedy. In the two-minute, four-second reel, movie characters discuss their impressions of Dory. Nothing hilarious results, but the segment amuses. For something meatier, we get The Octopus That Nearly Broke Pixar. It goes for nine minutes, five seconds and features Stanton, Collins, MacLane, actor Ed O’Neill and others the disc annoyingly fails to identify. They cover the challenges involved with efforts to bring Hank to life. We get some good insights here. With What Were We Talking About?, we find a four-minute, 31-second clip with Collins, MacLane, Stanton, and editor Axel Geddes. “Talking” looks at challenges related to the Dory character, with an emphasis on issues based on her elevation from sidekick to lead. It presents a short but tight overview. Casual Carpool lasts three minutes, 47 seconds and includes Stanton, O’Neill and actors Eugene Levy, Albert Brooks and Ty Burrell. This comedic piece shows a car-ride chat among all of the above. It’s silly but fun. With Animation & Acting, we locate a six-minute, 57-second featurette that involves Stanton, Burrell, Levy, O’Neill, Brooks, supervising animator Michael Stocker, animators Becki Tower and Trevor Tsung-Yin Hsieh, and actors Ellen DeGeneres and Kaitlin Olson. As implied, the program tells us a little about voice performances and their animation. This one tends more toward happy talk than its predecessors, but it still offers good notes. Next comes the three-minute, 20-second Deep in the Kelp. It features actor/ocean life enthusiast Jenna Ortega as she discusses the research Pixar did for Dory. Though nothing substantial, we get a few decent facts. Finally, Disc One gives us Creature Features. A three-minute, two-second reel, it offers statements from Brooks, Levy, Olson, Burrell, and O’Neill. They give us basic facts about the sea critters they portray. This becomes another enjoyable little clip. Over on Disc Two, we get five segments under “Behind the Scenes”. Skating and Sketching with Jason Deamer goes for four minutes, 14 seconds and includes notes from character art director Deamer. He gives us some insights into his work via this enjoyable piece. For the four-minute, 57-second Dory’s Theme, we hear from Stanton, music editor Bill Bernstein and composer Thomas Newman. They take us to the mixing board and give us info about the film’s music. Despite the clip’s brevity, it delivers useful material. After this we see Rough Day on the Reef. It occupies one minute, 11 seconds and shows computer rendering mistakes. Nothing great appears, but the quick collection can be amusing. An unusual piece appears via Finding Nemo As Told By Emoji. It runs two minutes, 47 seconds and shows exactly what the title implies – sort of. “Emoji” offers more animation than one might anticipate, but it’s still a cute bonus. “Behind the Scenes” ends with Fish Shticks. The three-minute, 35-second reel shows largely dialogue-free antics with the movie’s characters. It becomes another likable little addition. Four Living Aquariums come next. We find “Sea Grass”, “Open Ocean”, “Stingrays” and “Swim to the Surface”. These essentially act as video screensavers that provide running loops to show the environments/animals listed. I don’t see much appeal from them, but maybe others will like them. Seven Deleted Scenes fill a total of 50 minutes, 15 seconds. That running time includes introductions from director Andrew Stanton, as he discusses the sequences and lets us know why the failed to make the film. As for the scenes themselves, they offer interesting moments. All except one deliver animated storyreels. Cut from the film late in the game, “Sleep Swimming” provides full animation and audio – and the scene was viewed well enough that it even became the basis for the movie’s trailer. A few of the clips show alternate openings, and we also see a mix of character variations. Most of these offer entertainment – I don’t know how well any would’ve worked in the final cut, but they’re great to see. Lastly, Disc Two provides four trailers. In addition to a US promo, we get ads from Japan, Spain and Russia. I like the variety involved, so these become more interesting than usual. In particular, the Spanish trailer seems especially clever. A third disc provides a DVD copy of Dory. It includes the commentary and Piper but lacks the other extras. 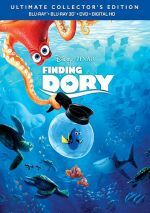 Like its 2003 predecessor, Finding Dory offers a breezy, likable piece of animated entertainment. Also like the first film, it fails to dig much deeper than that, which makes it enjoyable but not as strong as the best Pixar efforts. The Blu-ray delivers excellent visuals as well as very good picture and supplements. Though not a great flick, Dory presents an entertaining enough tale.